The history of the building of the cathedral of Maria Assumpta is typical of that so often met with in religious ventures. Construction started as long ago as 1954 since when it has progressed intermittently, chiefly because of lack of funds. Dublin architects were responsible for the general design of the Cathedral and the steelwork was designed in and supplied from Eire. On-site work is being done by local labour. By March 1966 the main part of the building had been completed apart from the roof decking and covering. 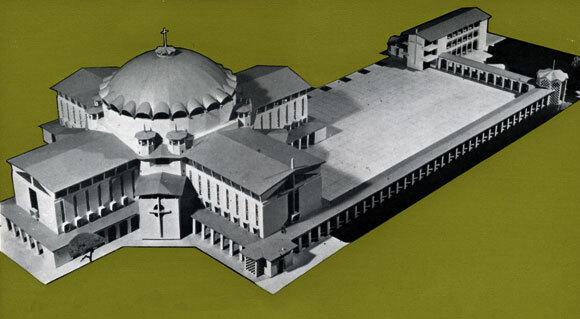 The Cathedral, which when completed will seat a congregation of 3,000, in sited in a commanding position at the junction of three roads about a mile from the centre of Owerri in the Port Harcourt area of Nigeria, and is planned in the form of a Greek cross measuring 230 ft by 221 ft with an 88 ft diameter dome at the crossing. Inside the building the arms of the cross span 48 ft 6 in. The dome, 93 ft 6 in high, terminates with an octagonal lantern, the ceiling of which is 101 ft above floor level. Radiating symmetrically from the centre are four smaller buildings forming a sub cross transforming the main Greek cross into an eight pointed star: two of the buildings house the 28 ft by 22 ft 6 in main side chapels and the other two the public gallery and the choir gallery. Above each of these buildings are twin octagonal belfry towers which form a predominant feature of the external massing, explaining visually the supporting and buttressing system of the dome. All four main roofs and that of the dome also are to be covered with copper-surfaced felt on timber decking secured to steel trusses through timber purlins. Ceilings will, in general, be finished in hardboard sheeting and exposed parts of the steel trusses finished in plaster. The dome, carried on an 11 ft high steel-framed drum, is constructed with 24 lattice ribs giving a purlin length of about 17 ft by light lattice girders. Domes have a tendency to spin, so to control this movement bracing is provided between two adjacent ribs in four sectors spaced 90 degrees apart. The 24 vertical legs of the drum portion are braced together in all bays and bolted to a ring of steel beams. At the top the ribs of the dome connect to a 10 ft diameter ring which is to carry the lantern surmounted with a cross. Outside this ring is another ring, 16 ft diameter, and both are braced together to control deformation of the 10 ft diameter opening. A similar circular bracing system is provided at the level of the tops of the lunettes. Certain considerations had to be borne in mind when designing the dome steelwork: (1) it was known that the last stage of the journey from Port Harcourt to site was by road over very difficult terrain, (2) erection tackle was limited to one steel mast and (3) scaffolding was scarce. Bearing these points in mind it was decide that erection should be done by progressively cantilevering the ribs inwards, commencing at bottom level of the dome. The rib section were made in 17 ft lengths with closed ends to prevent damage in transit and facilitate erection: as the weight of the sections did not exceed 4 cwt they could be manhandled without much difficulty. The dome was trial erected before dispatch and this provided an opportunity to check the proposed method of erection.